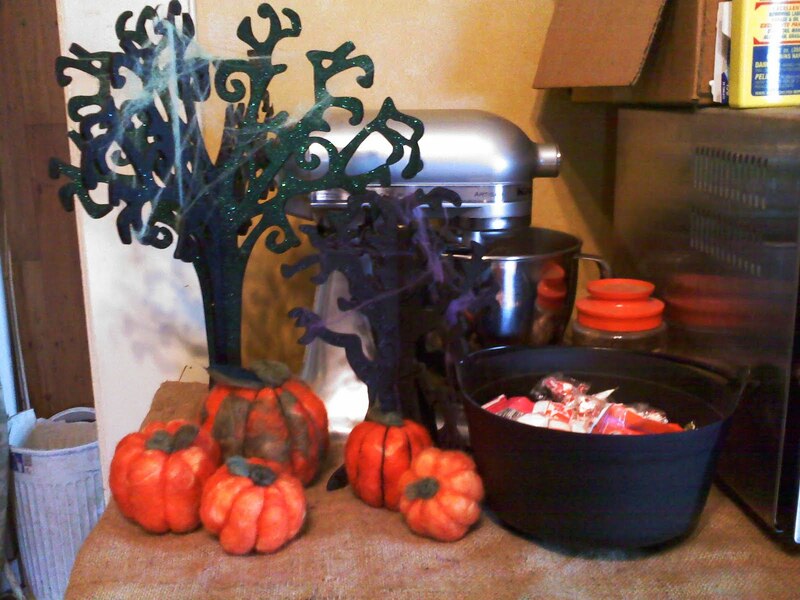 In the Merry Muddy Middle: Free Halloween decorations!! I love Halloween!! I got a wild hair yesterday and started decorating. I like to buy stuff after the holidays, when their on sale. I also make a lot of things. The trees below I bought, painted, embossed and added cobwebs in different colors. The pumpkins I made by needle felting. I love the magazine "Family Fun." They always have great ideas and things to do with the kids. I had not looked through our current issue until today. 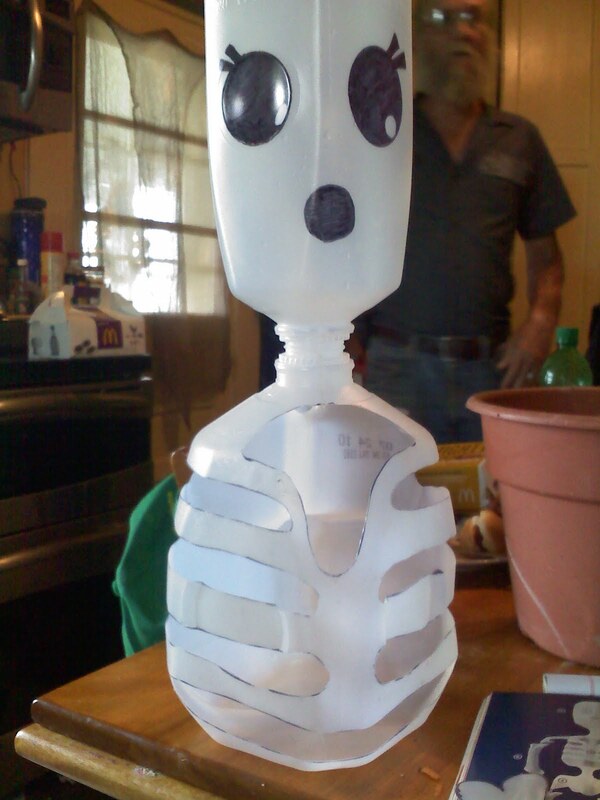 When I saw the milk jug skeletons I knew I had to make them. We have a fairly large fish tank, but we also have well water, which can leave trace metals that can start to accumulate inside it. So I buy water in 2.5 gal jugs. My son has been wanting to recycle, so the jugs have been collecting on the enclosed porch. This one is going to be a little smaller than the others. Its made from a half gal jug, a milk jug and the bones are cut from one of the 2.5 gal jugs. The directions say to cut out the eyes and mouth, but I wanted them to be a little more visible so I colored them in with a permanent marker. 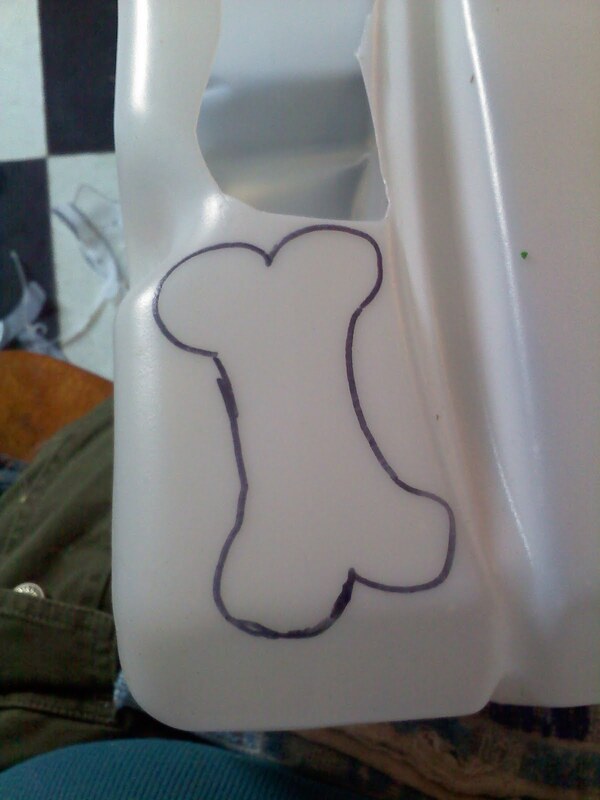 To make the whole skeleton smaller I cut out smaller shoulders, cut the bones smaller and will not be adding hip bones. I free handed the bones onto the larger jug and cut them out with a pair of kitchen sheers. The best parts are, I have enough jugs just laying around that I can do a whole family of skeletons, they look really cool and they didn't cost me any money!! Just a little time.